World Championship racing kicked off Tuesday, Sept 2nd in Canberra Australia with the Team Relay event. For the relay each country selects a Senior man, U23 man, Jr man and a female rider. The countries decide for themselves in what order to send out their racers and each rider does one lap at maximal tagging off to the successive rider. 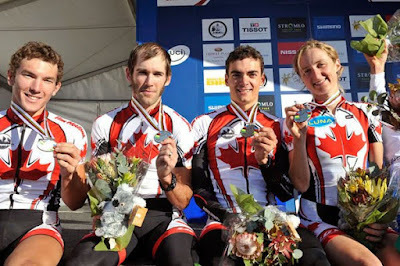 Canada chose to send our Under 23 rider Raphael Gagne first. Raph put in a strong start, but the riders were funnelled into a narrow tunnel less than 100m from the start and he got pushed out of the way entering in 12th position. On the technically challenging singletrack climb and descent passing is nearly impossible. Raph was able to hold onto 12th position and tagged off to our senior rider Geoff Kabush. Geoff put out the fastest lap of the day while coming though traffic and moved Canada into the bronze medal position. Next off Evan Guthrie put out the 3rd fastest jr men’s time and brought in another position moving Canada into silver and less than 10seconds back of France. Last to go, my job was to reel in France and hold off Italy for what we hoped would be a gold medal team effort. 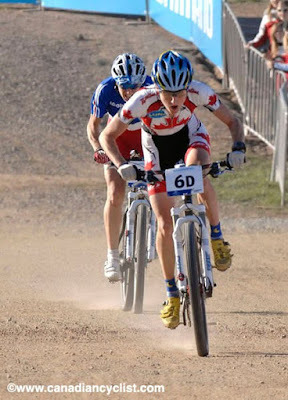 France’s Cecile Rode Ravenel was not going to give up the lead easily however. I hunted her down through the meandering rock littered climb, but a couple dabs cost our team precious seconds and I had to chase extremely hard on all the power sections to bring her in. On the last climb the Italian rider, an under 23 man, caught and passed me, but I was able to ignore the burn in my legs and lungs to grab his wheel and close the gap on France. Through the single track we were both of France’s wheel. While they fought for the front I tried to conserve and find the right spot to make my move. This secured Canada its first medal of the championships and we got to enjoy standing on the podium at a world Championships. Canada and Luna (Georgia, Chloe and myself) hope to secure more podiums before the week is out so wish us luck! Félicitations pour tes succès et bonne chance en Australie!